Here's an update on my week spent making etchings at Goathead Press, in Tieton, Washington. 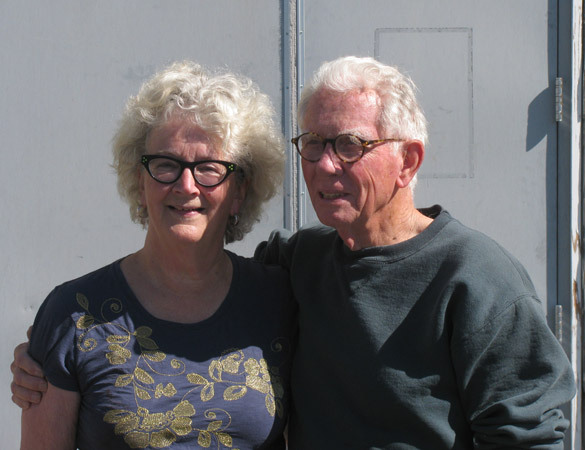 I'm grateful to the distinguished Seattle artists Bob and Fay Jones for giving me the opportunity to work at their print studio. I had never made an etching. They devoted the entire week to assisting me in learning the ropes. Their generosity, patience and sense of humor made it a relaxing, pressure-free time of "playing" with the media. In simplest terms, hard-ground etchings are created by scratching away a coating that has been applied to a metal plate (copper, in this case). 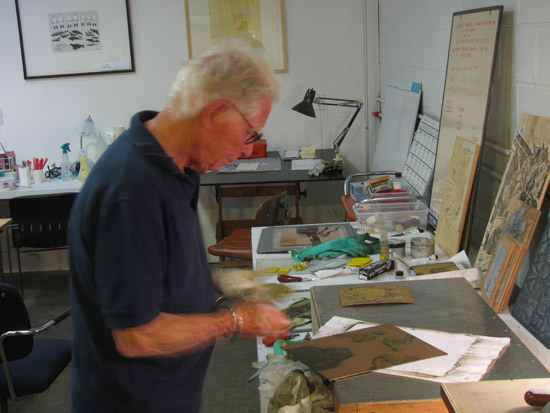 The image is drawn on the plate with virtually any kind of sharp or semi-sharp tool. I ended up using a pencil most of the time. It's only necessary to scratch through the coating, not into the plate. Once the drawing is complete, the plate is submerged in a bath of Ferric Chloride (a corrosive salt) for 40 minutes or more to etch the drawn lines into the plate. After cleaning the coating off, a layer of ink is applied, then carefully wiped away, leaving most of the ink in the recessed lines. Bob with freshly inked plate. 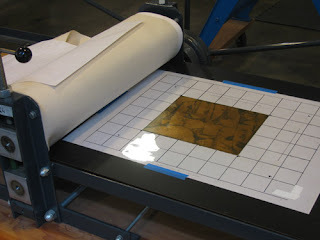 The plate is placed on the press bed and covered with a sheet of dampened paper. As the plate moves through the press the ink is transferred to the paper. The exciting part is that you never know exactly what it will look like until the printed piece is turned over. An etching plate by my longtime friend Karen Quint, inked and ready to go through the press. 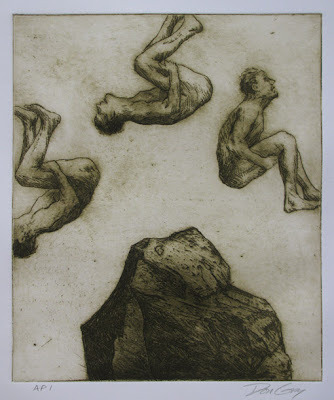 I completed two etchings dealing with themes I've been exploring recently. The stones for me speak of unimaginable periods of time--meditations on duration. I think of them as representatives of the living earth. While appearing solid and unchanging, their reality--like everything on this planet--is one of ceaseless change. Like us, they'll someday be dust. It will just take longer. 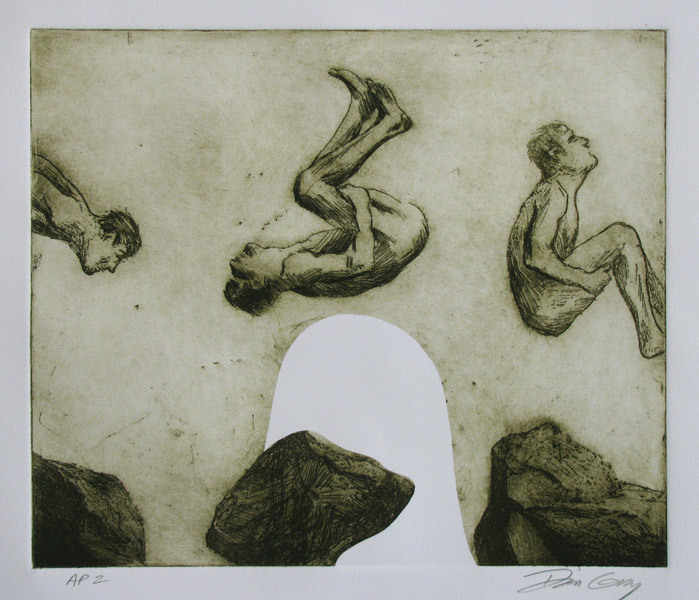 The tumbling figure is borrowed from the pioneering work of the 19th century photographer Eadweard Muybridge. Muybridge created the first human and animal motion studies--a precursor of the motion picture. I began creating drawings and paintings based on his photos over twenty years ago and they still retain a poetic hold on my imagination. The sequential images are of course narratives of time. I think of the specific figure as a stand-in for self and, in a larger sense, a metaphor for humankind. The acrobat speaks of the risks and joys of life. He appears to have a measure of control, but the outcome is anything but certain. There's also a kind of ludicrous aspect to these prints--a nod to the "human comedy". Let's face it, they're kind of funny. The edition size of each print will be limited to only 10, with a small number of Artist's and Printer's Proofs. Image size approx. 14" x 12"
Fun isn't it??! And addictive! Your prints are very cool and imaginative, Don. I'm glad you made me aware of the MT, which sounds like a great venture. I remember rock climbing on the Tieton many years ago, and it is definitely a destination area. An artist's community there is a thrilling idea. Sounds like a marvelous time! Love your results. More fun than I imagined, Deborah. And you're right--I want to do more! Thanks, Casey--I appreciate your work. Yes, MT is growing and worth a visit. It's relaxing and inspiring there. Hi Tanner--yeah, it was a great time. Thanks for your note. Your acrobat images are very compelling. I like them ever so much...but there was something odd about them...a dissonant chord. Then I realized that I was reading their motion like a book, from left to right, but the tumbler's head is thrown back, indicating that he is doing a BACK FLIP not a somersault! That really put a whole new spin on things! (terrible pun, I know...) and made me rethink the entire piece. What fun to become so involved in an etching! Congratulations! I greatly admire your boldly going to a new medium. The etchings are really good, too. I'd stay with this and see just how far you can go. Good work Don. I like these acrobats risking it all. That fuzzy black line that etching gives is so suited to these images somehow. wonderful result with your imagination added to the fever Don! Thanks, Anonymous (alias lochinvarwelsh) for your close observation--a new spin indeed! :) I used essentially the same pose for all the figures, with the thought that he could be seen to be going either way, but perhaps you're right--it's more a back flip. Hi Sheila--thanks. It's interesting--somehow the line is transformed on paper from how it looks in the plate. Thanks for the encouragement, Gary. I'd love to experiment further...guess now I need an etching press! Hi Martha--thanks a lot! Yes, I know that series and would love to experiment with more plates and additions to the image. I really like what you're doing with monotype lately.